Japan's National Statistics Bureau published the latest inflation figures last week. As expected, prices continue to rise, presumably lifting the nation from its prolonged cycle of deflationary pressures. But as discussed earlier, prices are generally not rising due to stronger domestic demand - which is what the nation really needs. 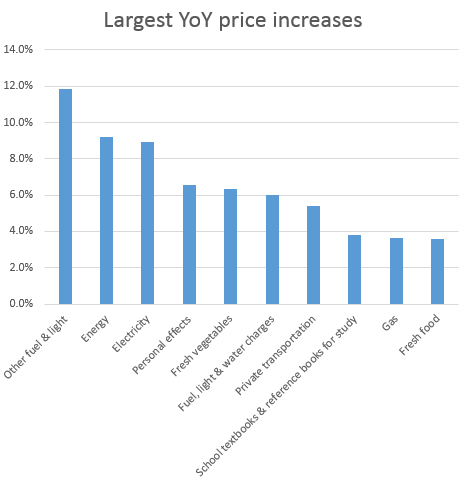 Instead a large portion of price increases is generated by weaker yen and costlier imports. And that could undermine consumer confidence. Reuters: - Some analysts expect core consumer inflation to exceed 1 percent by the end of this year mostly on rising energy and food prices. That may weigh on personal consumption, which would also feel the pain from an expected sales tax hike in April. "The rise in prices of daily necessities is negative for household sentiment and consumption," said Yoshiki Shinke, chief economist at Dai-ichi Life Research Institute in Tokyo. 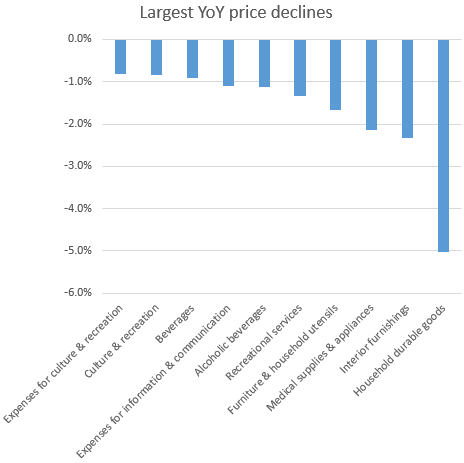 On the other hand prices on many domestically manufactured products (such as household appliances) as well as domestic services continue to fall. The problem with domestic demand continues to be negative real wage growth. You can't have sustainable inflation without rising household incomes. And serious labor reform may be the only way to correct that trend (see post). Reuters: - Economics Minister Akira Amari said it was too early to declare an end to deflation, stressing that wages and prices excluding energy costs had to rise more. "Japan is in the process of emerging from prolonged deflation," Amari told a news conference on Friday. "An exit from deflation will become distant if we're seeing cost-push inflation, where wages aren't catching up with rising prices," he said.